What Can a Citizen Do? 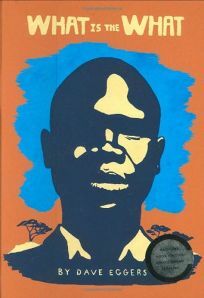 Valentino Achak Deng, real-life hero of this engrossing epic, was a refugee from the Sudanese civil war-the bloodbath before the current Darfur bloodbath-of the 1980s and 90s. In this fictionalized memoir, Eggers (A Heartbreaking Work of Staggering Genius) makes him an icon of globalization. Separated from his family when Arab militia destroy his village, Valentino joins thousands of other ""Lost Boys,"" beset by starvation, thirst and man-eating lions on their march to squalid refugee camps in Ethiopia and Kenya, where Valentino pieces together a new life. He eventually reaches America, but finds his quest for safety, community and fulfillment in many ways even more difficult there than in the camps: he recalls, for instance, being robbed, beaten and held captive in his Atlanta apartment. Eggers's limpid prose gives Valentino an unaffected, compelling voice and makes his narrative by turns harrowing, funny, bleak and lyrical. The result is a horrific account of the Sudanese tragedy, but also an emblematic saga of modernity-of the search for home and self in a world of unending upheaval.